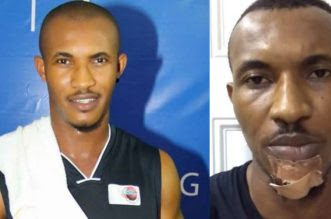 Tinsel star actor Gideon Okeke has narrated his recent ugly encounter with some officers of the Nigerian Police Force and LASTMA in the city of Lagos. According to Gideon, the incident happened at Lekki Phase 1. He revealed that he had a minor collision with a woman at the Lekki Phase 1 roundabout, only for the officers around the scene to pounce on him and beat him up. They also beat up the woman he had a collision with. Why? He wrote: "I AM NOT A MERE STATISTIC. "Yesterday, after I had finished from a scheduled meeting with @charlesotudor I left the Eko Hotel and joined the gradually building traffic leading on to Lekki. "Only a few minutes from my meeting, had I unfortunately run into a minor collision with another driver, Mrs Mosunmola Ilori, at the Lekki Phase 1 roundabout. We both inspected the damage(s), conferred and thought first, to get off the road for oncoming traffic. "Just less than 10feet away from all this were the Lastma and Police, sharing the police post at the roundabout. All I asked, was their assistance (witnessed by Mrs Ilori) in getting some barricades off the road for us to park properly and this scenario I have just described, turned into a full blown fiasco, seeing 4 police officers pounce on me and 2 others on Mrs Ilori and her niece. "I have come off this incident with stitches in my mouth and chin. Mrs Ilori as well, to the full glare and amazement of pedestrians and moving traffic, was ruffled up, beat, and dragged on the tarred ground. "The Leading man here was one Officer IDEH DONATUS who severally pointed a gun in my chest. I hereby humbly call on the executive governor of Lagos state, @akinwunmiambode the Vice President @profosinbajo the @policenglagos and its Officers, to kindly exercise the authority of your offices in addressing these civil injustices filed at the #MarokoPoliceStation Myself, Mrs Ilori, her niece and every other Nigerian citizen, don’t need to feel vulnerable with the police. "We appreciate them for their efforts in Protecting Lives and Property, but not for them to be THE THREAT! THE VICTIMS LIST IS OPEN-ENDED. POLICE BRUTALITY MUST STOP! TAG THE STATE GOVERNOR TAG THE POLICE COMMISSIONER TAG THE NIGERIAN POLICE TAG A PERSON OF INFLUENCE..."